Yes that, and little else. The New York Senate on Monday confirmed Governor Andrew Cuomo's 2nd nominee to the state's highest court. It did so unanimously and with a standing ovation. This was in stark contrast to the proceedings to confirm Cuomo's previous high court nominee, then-Professor Jenny Rivera. The Judiciary Committee hearing in February was more tense. More contentious. Senators were skeptical. The questioning was rigorous. There was none of that in the confirmation proceedings on Sheila Abdus-Salaam. No tension. No contention. No skepticism. No rigorous questioning. Indeed, almost nothing. The entire proceeding took less than an hour. The Senators said nothing of substance about the nominee. They asked nothing of substance. "Justice Abdus-Salaam, you are wonderful." That, and the like, were all the Senators said. "Justice Abdus-Salaam, why are you wonderful?" That, and the like, were all they asked. There was an evident subtext to the hearing: "Governor Cuomo, we are willing to be much more cooperative when you send us a nominee who actually is qualified by virtue of judicial, litigation, or other relevant experience--i.e., as opposed to your previous nominee." Well, if they gave the previous nominee a hard time, they gave Abdus-Salaam precisely the opposite. Yes, a love fest and little--no, nothing--else. Of course, now-confirmed Judge Abdus-Salaam may well have deserved a love fest. But the Senators on the Judiciary Committee have a job to do. They represent a branch of government equal to the executive. They have a role, just as critical as the Governor, in appointing Judges to the states highest court. Their constitutional "advice and consent" duty, choosing whether or not to confirm the Governor's nominees, is nothing less than to make the final decision about who gets to sit on the Court of Appeals. That duty, that responsibility, is not served by a mere love fest. Judiciary Committee hearings need not be partisan and contentious. The Senators' questions of the nominee need not be harsh. But the hearings and the questioning should serve the purpose of satisfying the Senators--and ultimately the full Senate--that the nominee belongs on the high court. Not merely that the Governor has nominated someone he says is qualified, and that his nominee does seem qualified. No. The Senate, as an equal and independent branch, has an equal and independent constitutional role. That role entails equally and independently assessing the Governor's nominees to the state's highest court. There was little evidence of that at the Judiciary Committee's short and sweet hearing. Yes, there were some positives. It would be unfair not to mention them. 2nd, Professor Michael Hutter of Albany Law School testified about Judge Abdus-Salaam's decisional record. It was substantive, analytical, enlightening, and, by a wide margin, the most worthwhile remarks at the hearing. 3rd, the nominee herself, who I met for the first time at the hearing, did seem to be wonderful. [Yes, now there I go myself.] And that's in addition to her judicial opinions which seem--to me as well as Prof. Hutter--to be superb. The hearing itself, however, was little more than 50-plus feel good minutes. Did no one have any real questions for the nominee? She delivered prepared remarks which ran about 8 minutes. Then there was a little back a forth. All niceties. Simplicities. Judges shouldn't have an agenda. Judges should apply the law; the Legislature makes it. Judges should interpret the law; they shouldn't bend it to their own preferences. Judges should be fair and just. Well, it just didn't get beyond that. No, not about the nominee's record or about the judicial role. Did none of the Senators have anything of substance to ask? Were all of them sufficiently familiar with her record? Did none of them have any questions about it? About any of her opinions? About her judicial philosophy? About her understanding of the role of a Judge on a court of last resort? OK, specifically, wouldn't any of the Senators, including her supporters [And again, I raise these as a supporter.] want to hear from the nominee about any of the following? Of Abdus-Salaam's 23 signed opinions, she won a majority only 6 times. Were none of the Senators in the least bit curious about that? In the 17 divided cases in which she authored a signed opinion (majority or dissenting), she won the majority only 1 time. Were none of the Senators in the least bit curious about that? Even her 16 dissenting opinions are far fewer than the number authored by many of her colleagues. What is her view of dissents and dissenting? Were none of the Senators in the least bit curious about that? Of the 17 divided cases in which she authored an opinion (majority or dissent), 4 were criminal cases, and in each of those she was in dissent--stated otherwise, in none of those criminal cases was she in the majority. Were none of the Senators in the least bit curious about that? In each of those divided criminal cases in which she authored an opinion, she disagreed with her colleagues to side with the defendant. Were none of the Senators in the least bit curious about that? Of the 11 cases in which she authored a signed opinion and the Court of Appeals reviewed her court's decision, the high court agreed with her only 2 times--stated otherwise, it disagreed with her 9 out of 11 times. Were none of the Senators in the least bit curious about that? And what about any of the countless possible questions about her judicial philosophy and her thoughts on the role of the judiciary? Were none of the Senators in the least bit curious about that? 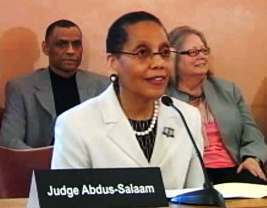 Abdus-Salaam may have chosen to author full, signed opinions only in those cases which she rightfully thought had important implications for the state of the law. And her opinions might be brilliant. In fact, she may have had the much better argument in every divided case at her court. Including in those criminal cases. She may even have had a much better argument than the Court of Appeals every time it disagreed with her. Indeed, my own view is that these possibilities are closer to the truth than other explanations or speculations. And she may have thought long and hard about the judicial role. I don't know. And there was absolutely no indication at the Judiciary Committee hearing that the Senators know either. Could it be that none of the Senators were in the least bit curious enough to ask her about any of this? To hear from her about any of this before confirming her? Before making the final decision to place her on the Court of Appeals where she will be entrusted with the most fundamental legal and societal issues? Well, of course they should have been. They should have cared enough. They should have taken their constitutional duty seriously enough. And they should have asked. Regardless of anything else, Congratulations to Judge Abdus-Salaam, and of course, all the best wishes for her on the Court of Appeals.